Today was one of those days. A sequence of events left everyone limping for homeopathic remedies for bumps and bruises. My kids are doing a morning tennis camp on the other side of the neighborhood this week of their summer summer vacation. Of course, I’m insisting that we ride bikes or scooters to and from the camp, and I’ve been escorting my kids and a neighbor boy each way. After camp today, we rounded a corner on the bike path with myself in the lead on my cruiser bike and my 8-year old daughter close behind me. Suddenly, I realized that I did not hear the 9-year old neighbor boy’s scooter behind us. I slowed and called for the boy. My daughter looked behind for him and ran right into my bike. I went down, scraping the back of my leg. She went down (thankfully) in the grass alongside the path, painfully bruising her upper left arm on the handlebar as she fell. The neighbor boy showed up around the corner having picked himself up from his own crash. Finally at home, I applied first aid to our cuts and scrapes, and offered a homeopathic remedy of arnica to help with the bumps and bruises. 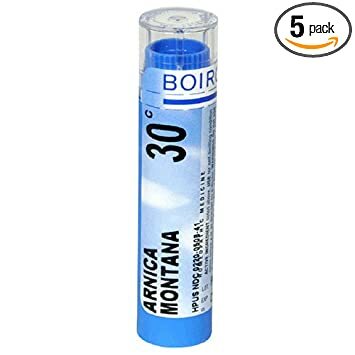 I think that homeopathic arnica montana is the most effective when an arnica pellet is dissolved in a few ounces of water and then swished around in the mouth before swallowed. I offered it three times within the first hour. Here’s more on how to take a homeopathic remedy. 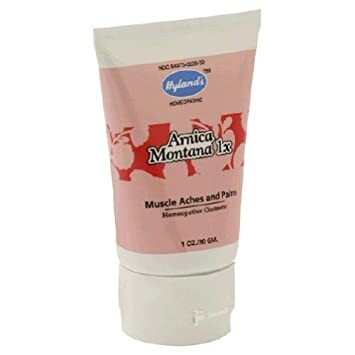 We also applied a topical arnica ointment to the bruised area and took a soaking bath in a dilution of Dead Sea salts after dinner. By bedtime, the upper arm bruise that I feared would compromise my daughter’s backhand at tennis camp, had shrunk significantly and was no longer interfering with her range of motion. By morning the bruise had shrunk significantly, though we still put another coating of arnica ointment on the area. She was able to have a great morning playing tennis with no pain or discomfort.